The Matoaka Bridge project kicked-off the Washington County Commissioners meeting Monday morning. 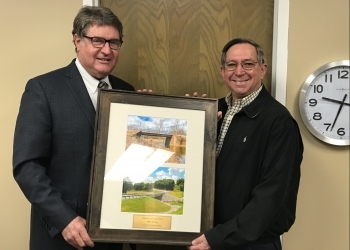 District 3 Commissioner Mike Dunlap recognized construction manager Steve Wright in the meeting during that time for his work and management of the project. Wright says the Matoaka Bridge project wrapped up last spring. The project took 120 days to complete and the weather cooperated well with construction crews. Wright would also say that the Cherokee Nation supported the project and that the Washington County Commissioners have been very proactive in mainting the county's bridges. Because of that, Wright says the bridge is much safer. The Commissioners would go on to approve a signature block for Bevan Creek. They also approved a 2019 Fiscal Year Emergency Management Grant contractual agreement in the amount of $45,000 with Washington County Emergency Management. A bid for a trailer mounted aggregate spray pothole patcher was discussed last. The Washington County Commissioners awarded the bid to JoCo in the amount of $25,000.